(October 16, 2014) Mecklenburg County residents can vote during Early Voting at the Steele Creek Library and 20 other county locations from Thursday, October 23 to Saturday, November 1. Any registered Mecklenburg County voter can vote at any site. Unregistered voters can no longer register and vote during Early Voting. To see all locations click here: Mecklenburg County One Stop Early Voting. Election Day is Tuesday, November 4, when voters must vote at their home precincts. Polls will be open from 6:30 AM to 7:30 PM. Provisional ballots are no longer allowed. For a map of precincts in Steele Creek, click here: Voting Precincts and Polling Places in Steele Creek. Note that straight party voting has been eliminated, so anticipate that you will need more time to vote this election year. Most voters will not need to show identification to vote until 2016, but poll workers should ask you if you have acceptable identification. If not, they should provide information on identification requirements. Some first-time voters may be required to show identification. See Voter ID Requirements in NC. Candidates are incumbent Senator Kay Hagan (Democrat), Speaker of the North Caroina House of Representatives Thom Tillis (Republican}. and Sean Haugh (Libertarian). 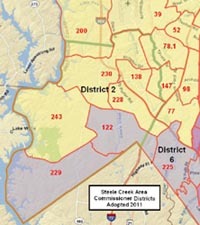 Most of Steele Creek is Congressional District 9. Incumbent Robert Pittenger (Republican) is running unopposed. Portions of northeast Steele Creek are in Congressional District 12. Candidates for this vacant seat are Alma Adams (Democrat) and Vince Coakley (Republican). Note that you must vote twice, once for the unexpired term ending in 2014 and once for the new term beginning in 2015. Click on the map at right for a larger map of Congressional Districts in Steele Creek. Most of Steele Creek is in North Carolina Senate District 37. Incumbent Jeff Jackson (Democrat) is running unopposed. Portions of northeast Steele Creek are in North Carolina Senate District 38. Candidates are incumbent Joel Ford (Democrat) and Richard Rivette (Republican). Click on the map at right for a larger map of North Carolina Senate Districts in Steele Creek. Most of Steele Creek is in North Carolina House District 92. Candidates are Robin Bradford (Democrat) and incumbent Charles Jeter (Republican). Portions of eastern Steele Creek are in North Carolina House District 102. Incumbent Becky Carney (Democrat) is running unopposed in that district. Click on the map at right for a larger map of North Carolina House Districts in Steele Creek. Note that several precincts are split by house district boundaries. Voters will elect at-large and district representatives to the Mecklenburg County Board of Commissioners. At-large Democratic candidates are incumbent Pat Cotham, incumbent Trevor M. Fuller, and Ella B. Scarborough. At-large Republican candidates are Scott Carlisle and Emily Zuyus. Most of Steele Creek is in County Commission District 2. Incumbent Vilma D. Leake (Democrat) us running unopposed. The two Southern precincts in Steele Creek are in County Commission District 6. Incumbent Bill James (Republican) is running unopposed. Click on the map above right for a larger map of Mecklenburg County Commissioner Districts in Steele Creek. Mecklenburg County comprises District 26. Incumbent Andrew Murray (Republican) is running unopposed. Candidates are Elisa Chinn Gary (Democrat) and Martha Efird (Republican). Candidates to replace retiring Sheriff Chipp Bailey are Irwin Carmichael (Democrat) and Chris Hailey (Republican). There are four seats in the election. These races are nonpartisan. One Court of Appeals Judge's position has 19 candidates. The candidate with the most votes will win the election. There will be no runoff. Candidates are John S. Arrowood, Betsy Bunting, Jeffrey M. Cook, Lori G. Christian, J. Brad Donovan, Daniel Patrick Donahue, Sabra Jean Faires, Abe Jones, Ann Kirby, Keischa Lovelace, Hunter Murphy, Marty Martin, Jody Newsome, Tricia Shields, Elizabeth Davenport Scott, John M. Tyson, Chuck Winfree, Marion Warren, and Valerie Johnson Zachary. Most of Steele Creek is in District 26C. Candidates are incumbent Bob Bell and Justin William Moore. There is no race for District 26A. There are nine seats in the election. These races are nonpartisan. You may vote for two. Candidates are incumbent Nancy G. Carter and Shawn Greeson. Constitutional amendment providing that a person accused of any criminal offense for which the State is not seeking a sentence of death in superior court may, in writing or on the record in court and with the consent of the trial judge, waive the person's right to a trial by jury. To check your registration, view your sample ballot, and see other 2014 election information, see the Mecklenburg County Board of Elections web site.